If someone says “no offense, but’, what do you expect to follow? You’re likely to hear something that is not very nice. When someone says “no offense’, they are about to tell you something offensive but expect you not to be offended. “No offense” means “Please don’t feel insulted” or “I don’t mean to offend you”. 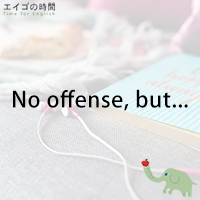 ‘No offense” may come after the sentence which in fact is offensive. In that case, “no offense” means “I hope you haven’t been offended by what I said”. Let’s say an idea is presented and you don’t like it. You can say: No offense, but I don’t think it’s a good idea. You can also say: I don’t think it’s a good idea, no offense. I’m going to give you some more example sentences on the website. So come visit us on Thursday. In the meantime, I’ll give you a quiz. I’ll read three sentences. Please listen carefully and choose the one that uses the phrase “no offense” most appropriately. Ready? 1. No offense but I don’t like your girlfriend. 2. No offense but you’d better go home right away. 3. No offense but you look wonderful in that dress. Next Post 気にしないよ – None taken.